There are many people who want straighter teeth but are too embarrassed to go through the treatment. Traditional orthodontics come with unsightly metal brackets and wires that make a good amount of patients cringe. 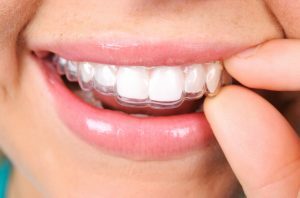 In 1998, Align Technology developed Invisalign clear aligners for patients that wished to straighten their teeth in a quicker, more discreet way. Thankfully, Larry Young Dental offers this revolutionary straightening treatment to local patients. If you want to fix a crooked a smile, think about visiting your dentist in Jacksonville first to discuss Invisalign. Orthodontic treatments used to be considered only for young children and teenagers. Now, more adults are considering straightening their teeth. Patients realize they can improve their smile without having to bear the embarrassment that metal brackets may bring as an adult. A lot of the time, patients would like to avoid the hassle that metal brackets bring as well. Fortunately, Invisalign in Jacksonville is for everyone. Invisalign clear aligners use several custom clear aligners during your straightening process. Your dentist will take impressions of your teeth, consider the correct positions they need to be shifted to, and create clear aligners that will gradually shift your teeth appropriately. They constantly apply gentle pressure to guide teeth into the correct locations. As you get further into your treatment, you will replace each aligner with the next in the series until your teeth have shifted to the correct positions. Your custom aligners will be practically invisible and removable. Keeping your straightening treatment on track is as simple as wearing one set of aligners for about two weeks, removing them only to eat, drink, brush, and floss. At Larry Young Dental, we value and understand the importance of having a gorgeous smile. Crooked teeth not only hold down your confidence, it affects your first impression on people and even your oral health. You spend less time at the dentist than with traditional braces, only visiting our office every six to eight weeks. You experience comfortable orthodontics provided by plastic aligners that are flexible enough to offer a snug fit and strong enough to shift your teeth. You can still enjoy your favorite meals and snacks with limited dietary restrictions. Your hygiene routine at home stays simple, easy, and convenient because your aligners are removable. You can smile without worry because your custom aligners are virtually invisible. How can I start my Invisalign treatment? If you’re experiencing issues with gapped teeth, a misaligned bite, or overcrowded teeth, you can find a solution today. Larry Young Dental can help you solve the problems with your smile in an innovative, secret way. To find out if Invisalign clear aligners are the right treatment for you, contact our office today.